Can a stroll up to Whyte Avenue be considered a walk? It’s 12 blocks there and back. No? Well, of course not. First of all, there are no hills, other than the curbs. No bodies of water either, unless you count the various puddles along the way, which following a Saturday night, are neither water nor solid but somewhere in between. Sure, it’s ‘hip’ and ‘youthful’, but where are the squirrels? I cannot consider my efforts today a full-blown walk, but I was under the sun for a short time, and my feet did move in a purposeful way. 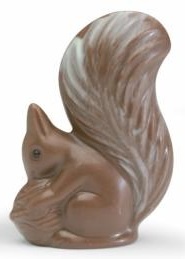 The important thing to remember is that I was able to carve out more time to dunk chocolate rodent heads in coffee, and on this holy day, contemplate the holy deliciousness of Easter. I’m sure the squirrels will be there tomorrow, as I waddle about on the trails.